The Alan Levin Department of Mechanical and Nuclear Engineering offers undergraduate degrees in mechanical engineering and mechanical engineering with a nuclear option. Graduate degrees are offered in both mechanical engineering and nuclear engineering. Amy Betz, associate professor in the Alan Levin Department of Mechanical and Nuclear Engineering, has been named the new assistant dean for retention, diversity and inclusion in the Carl R. Ice College of Engineering. Alan and Jan Levin invest in the naming of the Department of Mechanical and Nuclear Engineering in the Carl R. Ice College of Engineering. 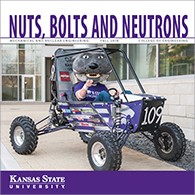 An interdisciplinary team across three colleges and six departments at K-State is actively recruiting participants for a five-year, $2.9 million National Science Foundation Research Traineeship Program, or NSF NRT, the first ever awarded in the state.